The Nexus 95mW is bright enough that the target is clearly visible even in bright daylight. The actual beam isn’t so visible during the day, but is clearly visible when indoors. 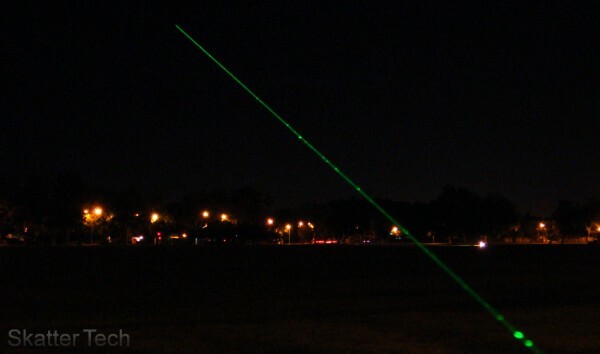 At night this laser pretty much resembles a Star Wars light saber. The beam doesn’t seem to ever end if you shine it into the sky at night. This is excellent for pointing planets or stars. It’s power might not be the best for all situations, for example a PowerPoint presentation. The laser will probably be much brighter than your projector and will most likely blind the audience. At night the Nexus can literally light up an entire room. The laser pointer is actually quite compact, it’s roughly the size of an average pen. 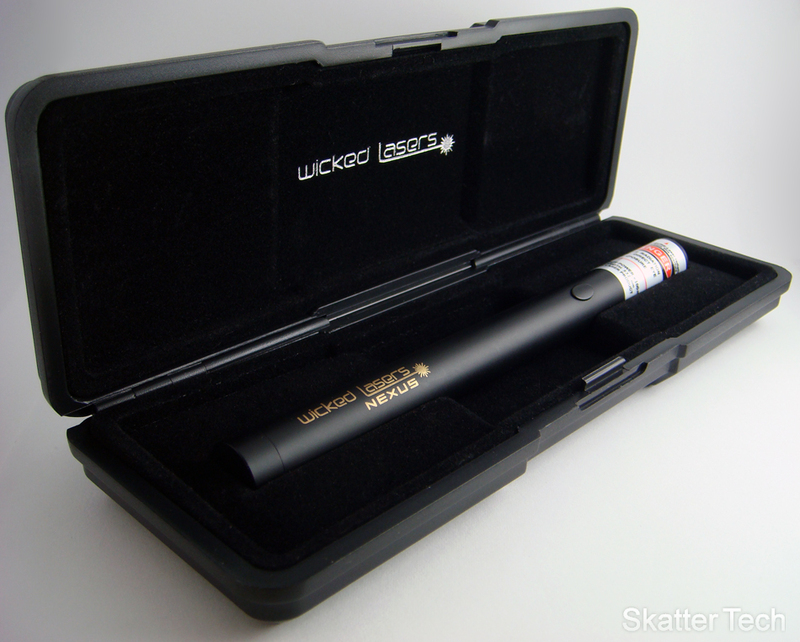 Wicked Lasers also includes a neat little hard carrying case to protect the device. The Nexus runs off 2 standard AAA batteries. The laser’s true performance will probably be best experienced in the first 15-20 minutes of use since it’s powerful diode rapidly drains battery life. Wicked Lasers also recommends avoiding continuously using the laser for over two minutes without allowing it to cool. If it overheats, it may damage the laser diode. As for the fun stuff, you’ll be able to light matches after a few seconds. It can easily burn through garbage bags, however you’ll need to be within a couple of inches for it to work. The same goes for balloons. Unfortunately the Nexus won’t do much to anything if you are more than a foot away. For a quick comparison of how powerful the 95mW Nexus is compared to the 5mW Core, I snapped an image of both of them pointed a couple inches away from each other. If you’re having a hard time making out the image, the small circle on the left is from the 5mW laser and the big one is from the 95mW. 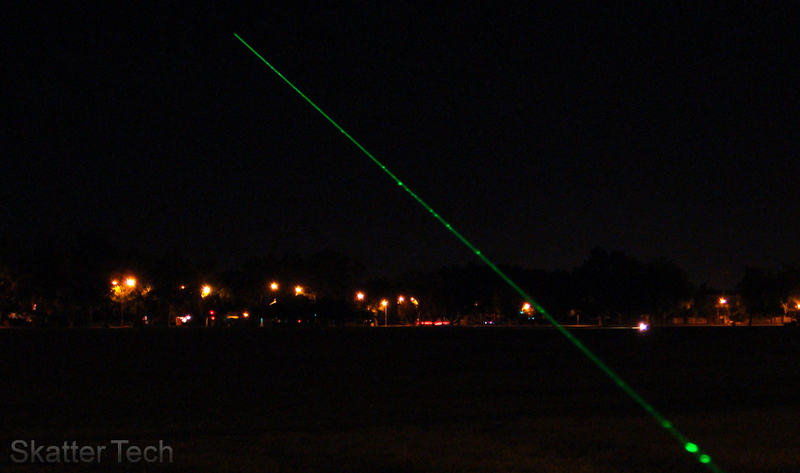 Overall I was quite impressed with the Nexus, it was by far the most powerful laser my friends or I had seen. The only downside to all of this might just be the price tag. 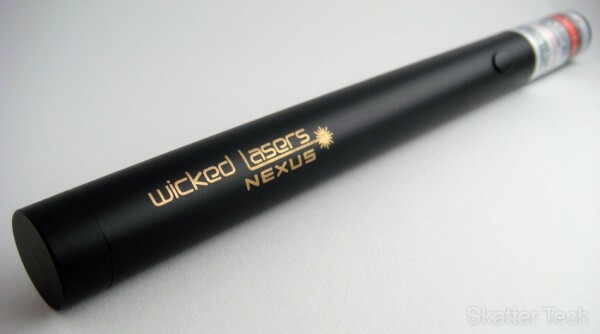 The Nexus 95mW retails for about $400 on Wicked Lasers’s website. You probably won’t be purchasing this just for the hell of it unless you fell like spending some cash, but if you do become an owner, you won’t be disappointed. Wicked Lasers also sells 300mW, but as expected that’s going to cost a whole lot more. If you are worried about making a purchase, keep in mind that Wicked Lasers includes a 3 month warranty which should cover defects. Notice: The Wicked Lasers Nexus a pretty fun little gizmo to mess around with, but if you haven’t guessed yet, this is definitely not a toy! This laser can badly sting your skin in a couple of seconds of exposure, which means that even a second of exposure to the eye may cause some serious damage. So it may not be a good idea to allow children to handle or even use around others unaware of the danger. So beware and be cautious when handling it. No one wants to be responsible for permanently blinding someone. Nice, But those lasers are usually a little pricey for my taste especially when you can make one that can ignite wood out of an old DVD burner. This laser will also turn off security lights if you hit the sensor with it. The light will come back on in about 5 minutes. Awesome! I want one. But what will I do with it? You can feel the true power of a Jedi! my friend have that green laser, but its chinese brand..
Why are some blue 5mw lasers over $500 and the 1W S3 Arctic is only $300???? what is speacial about them?